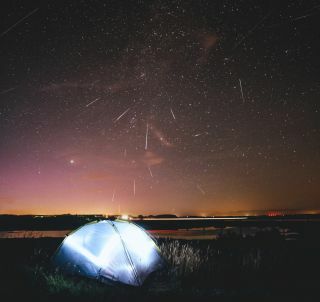 Photographer Ruslan Merzlyakov captured this spectacular photograph of the Perseid meteor shower filling the Danish sky in the early morning of Aug. 13. "I have been outside for about 3 hours, and the results are bloody fantastic!" he said. The sky was clear the entire time: "Lots of Perseids and Northern Lights had just exploded in the sky right over my hometown. For now, I am not going to argue with Danish weather, because I am 200 percent happy!" The moon posed no obstacle as the Perseid meteor shower peaked last night, giving some skywatchers the best views of shooting stars in years — even in areas that usually have too much light for skywatchers to see anything. And the show will be back on tonight, although there will be fewer meteors falling per minute. The Perseid meteor shower comes around every year as Earth passes through the debris left in the wake of Comet Swift-Tuttle, a 6-mile-wide (10 kilometers) body that orbits the sun every 133 years. This year, that crossing happened during a new moon — unlike last year, where the peak of the shower occurred during a bright, nearly full moon that obscured the would-be show. Photographer Chris Bakley captured this spectacular photo of a Perseid meteor streaking over Cape May, New Jersey during the Perseid meteor shower's peak on Aug. 12, 2015. "Just wanted to share my shot of the meteor shower tonight with you," photographer Chris Bakley wrote in an email to Space.com. "Best meteor shower in years!" He captured the photo in Cape May, New Jersey. Describing his photo titled "Space Camp" (top image), astrophotographer Ruslan Merzlyakov agreed. "Bloody fantastic!" he said. Each Perseid meteoroid reaches more than 3,000 degrees Fahrenheit (1,650 degrees Celsius) as it flies through the atmosphere at 133,200 mph (214,400 km/h), and leaves a glowing trail of agitated particles in its wake. It's that trail that's visible in the night sky, not the debris itself — the meteoroids are mostly the size of sand grains, although they can reach pea- or marble-sized on occasion. They burn up as they race downward at a rate of about 60 meteors per hour during the shower's peak, when the Earth is traveling through the most debris. This amazing view of a Perseid meteor was captured by amateur astronomers Stojan Stojanovski, Kristijan Gjoreski and Igor Nastoski of the Ohrid Astronomy Association in Ohrid, Macedonia during the peak of the Perseid meteor shower on Aug. 12-13, 2015. Stojan Stojanovski sent five amazing images to Space.com, taken by himself and amateur astronomers Kristijan Gjoreski and Igor Natoski of the Ohrid Astronomy Association in Ohrid, Macedonia. The highest concentration of meteors was visible after 3 a.m. local time around the world, although it was possible to catch a glimpse beforehand, starting at around 11 p.m. The best views were in the Northern Hemisphere, according to a tweet from NASA's Marshall Space Flight Center. Photographer Shreenivasan Manievannan captured this stunning view of a Perseid meteor streaking across the sky near Lake Jocassee in South Carolina on Aug. 12, 2015 during the peak of the Perseid meteor shower. "I am trying to capture the mood of the night with this shot as I resorted to chilling out near the Lake Jocassee," photographer Shreenivasan Manievannan said in an email. "It was tough to find the Perseids amongst the clouds and soon; one shone across the sky just in the gap to put on a nice display." Space.com managing editor Tariq Malik caught a glimpse as well through a battle with clouds, from his home in West Orange, New Jersey. "I was surprised to see a brilliant Perseid streak overhead despite the bright lights of my street, before the clouds rolled in to block the view," he said. "It only took a few minutes of sitting on the porch to see a Perseid last night, but once the clouds rolled in, I had to go inside." Editor's note: If you snap an amazing picture of the 2015 Perseid meteor shower or any other night-sky view that you'd like to share for a possible story or image gallery, send photos, comments, and your name and location to Managing Editor Tariq Malik at spacephotos@space.com.